Recently, I noticed a conversation under a review of one of my books on its Amazon page. The initial commenter, after reading a long and thorough review of the book, left a comment saying they were sorry to hear there was a “Christian theme” in the book because he/she was an atheist and had wanted to recommend the book to another atheist based on their disagreement on Roundup-Ready seeds. A second commenter chimed in with their two cents, noting that the main theme of the book had to do with misuse of power and greed, and pointing out that many children do grow up in families with some sort of religious belief. The second commenter then came back and reiterated that though the book wasn’t perfect, they enjoyed that it showed the children as thinking individuals. This is the way I see it: Treasure is about kids being empowered and making change. This is the way I see it: Treasure is about kids being empowered and making change. Somewhat like the hobbit–smallest of all the fellowship–being the one to carry the ring. I wrote the story as a pantser, not a plotter, and the siblings turned out to be church-going kids, mainly I suppose, because this is where they first heard about the banned seeds: in a sermon about seeds (And symbolically, I suppose, using the church’s role as sanctuary). Also, because I’ve been around a lot of children, and they often have deep spiritual insights and questions. The elderly mentor uses the text in the Bible about food because it’s what she has in the oppressive world in which they live. The instruction is about horticulture, not Christianity. The instruction is about horticulture, not Christianity. The children pray because it is who they are and I didn’t feel right censoring it, although I did worry that some people would deem the book unfit for schools because of it. Which is sort of a sad irony based on all the other things found in books that could disturb children. Trying to recall my internal debate on the issue, I believe a lot of it had to do with Harry Potter. When the first Harry Potter book came out, there was much hullabaloo in certain Christian circles that the books were full of witchcraft and bad for children. Many people dismissed the books without having read them. In Treasure, when the children say little prayers, I likened it to the spells in Harry Potter. When I included a Bible passage it was something poetic, like Shakespeare or the long songs and poems in Lord of the Rings. It was all from the Old Testament, so not exclusive to Christianity. And what about the children who do go to church or synagogue and pray before meals or when they are afraid? Do they not deserve to see characters like themselves in literature? And what about the children who do go to church or synagogue or pray before meals or when they are afraid? Do they not deserve to see characters like them in literature? I guess I knew these elements might make some people dismiss the books, but I hoped that non-religious people would not do the same thing as the anti-Harry Potter camp and write the whole thing off. Sadly, there have been a few comments to that end. Personally, my favorite books—Peace Like a River by Leif Enger and The Secret Life of Bees by Sue Monk Kidd—both have strong spiritual themes running through them. To leave out a spiritual dimension sometimes seems to me a gaping omission. My hope is that Seed Savers can be read and discussed by people with differing viewpoints, rather than avoided. My hope is that Seed Savers can be read and discussed by people with differing viewpoints, rather than avoided. 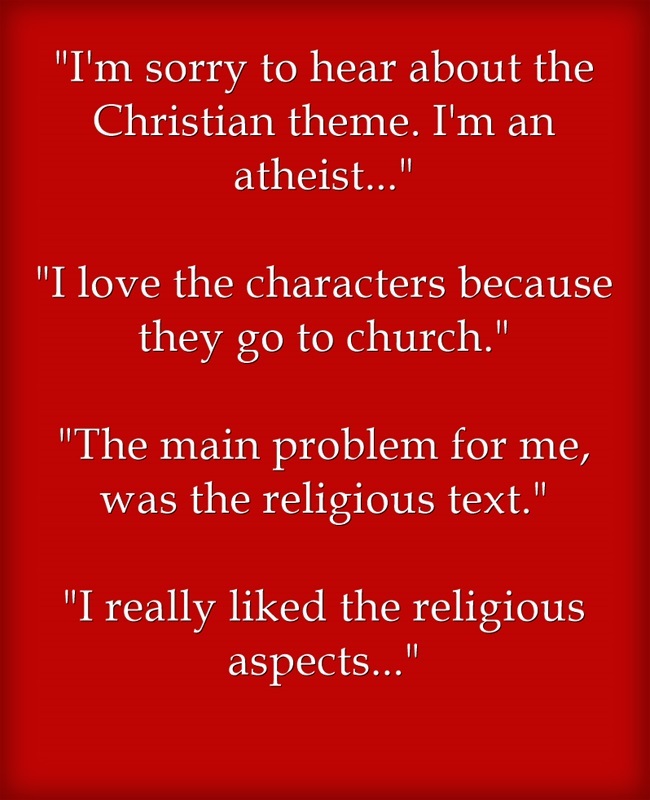 If I were to chime in on the comments on Treasure’s page, I might make the simple suggestion that the atheist friend start with book 2, as the friend Lily has no religion. On the other hand, I’m not sure avoiding people who adhere to religion is a good option, considering they are our friends, neighbors, co-workers, and family. I would much rather we learn acceptance rather than avoidance. Well, you can get an amen from me, even though I’m probably an atheist if I’m anything. I have a horrible feeling creeping through my bones that … well, enough said. Maybe I was feeling ultra-sensitive to certain ideological issues at the time of writing. I would certainly recommend Seed-Savers to anyone who wishes to debate the benefits of round-up ready seeds. I was horrified in the last couple of weeks to hear (a) that the EU is pressing on with another attempt by the seed companies to outlaw seed saving, even by individuals for their own use, under a patenting regime. Anyone in the EU can contact Garden Organic or their own organic/bio organsiations for an update on this. The second horror (b) was a respected tv programme saying that GM seeds were ideal for people who had difficulty growing crops e.g. in blighted areas, and how well they would overcome famine. I don’t think she understands that losing natural seeds will mean farmers in developing countries have to buy seeds forever, ones that are only adapted to certain conditions, which could bring more disaster as climate change hits us. But then again, Sandy, it’s great to know your books are raising this debate! I keep recommending them to people who think it can’t happen. It can and is… horribly fast. Thanks, Jemima. When I hear stuff like that about the EU I never know whether to believe it because it sounds too alarmist…REALLY? I hope not. As for the book…I just hope there aren’t a lot of people who are afraid to read it because some of the children believe in God. That seems like a shabby reason not to read a book. And as for diversity. . . There are a lot of kids out there who do go to church and believe in God and isn’t it important that they see characters like themselves in literature? Isn’t that what the call for more diverse lit is about? Anyhow, my two cents. Thanks for the support! You can get an amen from me too. It’s funny but to me, other religions are like other cultures, a window on different ways things are done can only enlighten us in the long run. It should be possible to be a Christian and believe Darwin was right, it is here in Britain even if it isn’t in America. The whole ethos of the New Testament is an attitude, above all. And there’s only one commandment of course, be kind to one another. Perhaps people feeling that a book with Christians in is inappropriate for their pure atheist children points to something lacking in themselves rather than their kids. Just as the people who think they can’t believe in a loving God and accept scientific truths at the same time are … well, they clearly haven’t read the New Testament, or the Old Testament, in their correct historical context… or at least if they have, they certainly haven’t got the message. I doubt there would be any debate if this was about geographical origins or colour. And I’m with Jemima about GM seeds, yes designed for certain conditions is good but not for people living off the land. It’s that whole baby formula in the third world debate again, isnt it? Lovely thought provoking piece, anyway. I do think various religious beliefs are part of diversity, but it sometimes seems that the only acceptable religion shown in children’s literature is no religion; and that leaves us in very barren land indeed. Agreed. And done with compassion and sympathy, religion is benign force, which can guide people into actions of great compassion and kindness. If it doesn’t my own view is that the branch of the religion in question is veering towards being a cult. I am something called an Anglican which is a very laid back version of Christianity. Basically you just ask what Jesus would do in any given situation. I gave the folks a version of that as their religion in my books, because I don’t think that religion is necessarily a bad thing if believers adhere to the bits about tolerance for others etc.